Venerable black-cover anthology from Library of America. I’m not much on detective stories and mysteries and have a low threshold. I always return to it because Chandler was such a terrific writer. I keep going back to read “Red Wind.” Not for the story as much as Chandler’s writing style, especially in the opening scene. As with most of Chandler’s stuff, there are clever, memorable lines and a succinct presentation of California ambience surrounding the characters. Some of Chandler’s narrative tone can sound dated now, co-opted and twisted by years of TV detective shows and b-grade movies. Chandler is much better than that sort of tough-guy stuff. He was an artist, not merely someone who produced pot boilers. The guy could crank out great sentences and imagery. His narrative talent is legend among California’s struggling writer types, so a West Coast correspondent informed me. 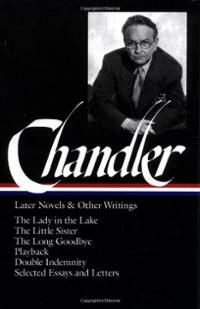 Chandler is someone to emulate on the path to a movie script. Of the shorter pieces in the collection, I think the best is “Spanish Blood.” It has all the right ingredients of a short story and is more straight-ahead and satisfying. It’s not so puzzling and convoluted like the majority of mystery stories tend to be. Posted in booknotes on December 30, 2014 by Wm P.